Kristal Hoff is an advocate and volunteer in Canada with Hands at Work in Africa. 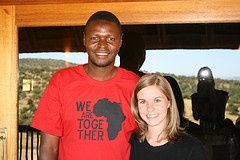 She and her husband, Will, recently took a team of ten individuals from around the world to visit vulnerable villages in South Africa, Zambia and Malawi. Kristal reflects on her experience with the Serve and Learn Team in their final weeks. After 2 months of traveling around as a family of 10 we have come to the end! We are surprised and truly thankful that we all came back in one piece and are still loving each other. What an amazing journey! We wrote last about our time in South Africa. Since then we have traveled through Zambia, starting with a few relaxing days in Livingstone and staying the remainder of our time at Kachele Farm, home of the Zambian Regional Support Team. We visited communities called Mulenga, Mwaiseni, and Maranatha. From there we bussed to Malawi. We stayed at the local Hands at Work office in Dedza, Malawi and visited communities called Mngwere, Mcheneka, Maonde and Chinku, with even a trip to Lake Malawi. We really had the sense of going deeper and deeper into Africa. While in Zambia we had the opportunity to spend time with and be challenged by amazing leaders that are truly anointed by God. James (one of Hands at Work’s regional coordinators in Zambia) shared with us the Christ he knows. He started by asking us if we were Christians. We all said, “yes”, but he continued, “Are you sure?” Lisa looked at me, with tear-filled eyes, and said, “I feel like I'm with Jesus.” Erick, Hands at Work’s coordinator for the work in Democratic Republic of Congo shared his heart for the vulnerable in his country and especially for Goma, a war-torn area that is so hostile. We were moved to commit an entire day to fasting and praying for breakthrough. Mulenga was a community many of us fell in love with. We were deeply impacted by the dedication of the care workers in building relationships with their children. One man in particular, Reuben, challenged many of us in the way we serve. I visited a home of a young girl named Joy. She is 5 years old but could easily be mistaken for 2. Her hair is reddish and quite thin. Her mother abandoned her a few years ago and the woman who was currently looking after her also ran out on her. She was left with a 17-year-old girl and 4 other children under the age of 7. This was the first time in all of my time in Africa that I felt deeply that I needed to take her home. I wept the entire visit. We then walked to the care point where Joy was to get her meal. She sat on my lap as she spooned the rice into her mouth. All of a sudden I heard her scream, “Pastor!” I looked up and saw Reuben running toward her, arms in the air with excitement. He gave her a big high-five and I could feel everything in her lighten. This for me was a real glimpse into the Kingdom of God. Reuben later told me that people in the community were calling Joy strange names, like Chameleon. He changed her name and said for the rest of her life she will find joy in the Lord. And she will, because not only does Reuben and many others unconditionally love her, but she knows she is loved. That's the most beautiful part. This was our entire 2 months—seeing and experiencing true glimpses into the Kingdom of God. Men and women of God that have been raised up, anointed, and are serving their Lord completely selflessly by loving those that no one else does. There were many care workers like Reuben. It really challenged us and put the way that we selectively serve to shame. While in Malawi, we had the privilege of staying 3 nights in the community of Mngwere with care workers. This allowed us to get real insight into their lives: how they live, who they live with, their daily challenges. We discovered how vulnerable even they are! They struggle daily for food, they grieve the loss of their own children and spouse, feel pressured by some of the easy, but negative, ways to earn money, and many other unique challenges. Traveling from country to country, through borders, on busses was miraculously easy and smooth, but still had its challenges. Entering a new country means a new language, a new currency, new songs and names, new culture and customs. We were always thinking, always converting, always fully aware of our surroundings and our actions. We were really surprised as to how fast our team caught the heart of Hands and how keen they were in every situation to serve the Hands family and care workers. What we were mostly surprised and impressed with was also the responsibility they took in doing these things. They didn't travel around with the intention of having great experiences and writing down great stories, but rather to give themselves completely in everything they did, and most especially in encouragement. It was amazing to see someone sitting down with a care worker or a Hands bookkeeper, sharing scripture and encouragement and praying together. Our hope in this uniqu e trip was not for people necessarily to fall in love with Africa or understand poverty better or think that Hands is the best organization working in Africa, but for people to fall deeper and deeper in love with Jesus and live that out fully. To be removed from the pressures of their culture and lives to really experience the heart of God lived out by some of the most unexpected people, diamonds in the dust. And these 8 individuals did. They won't be the same, I can attest to it. I've seen them wrestle and struggle and question and look deep into their own hearts and lives as they sat in the homes of vulnerable and broken children, while they walked alongside beautiful, dusty feet, and while they listened to stories of grannies praying to live longer to care for their grandchildren. The Serve and Learn Team is a unique opportunity. It is a short time commitment, but individuals get deep into Hands at Work: into our heart and family and deep into our communities across Africa. It's about learning in action, learning as you're serving, and recognizing that some of God's most anointed and chosen people sit in shacks on nameless streets. No one knows how old Sekani is, but many guess he is around 30. 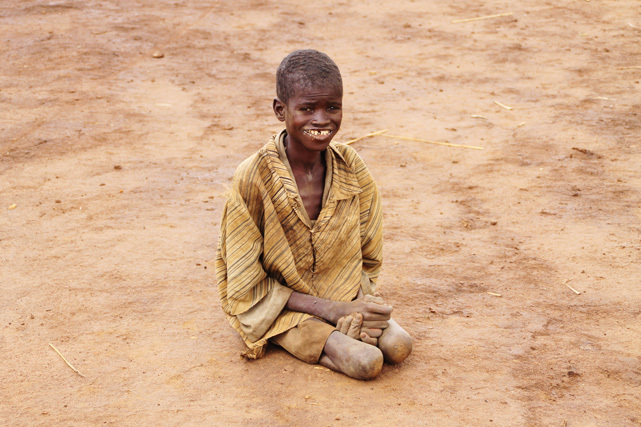 It seems for decades he has spent his days sitting alone on the road outside his home in the community of Maonde, Malawi. His mother is a poor farmer who became an alcoholic – a desperate attempt to cope with the stress of her poverty. This resulted in Sekani being born severely disabled. He can hardly speak, and he cannot walk. This tragedy is made even worse through the rejection he has felt: most days receiving no food, never having gone to school, and never having known a father or mother who lovingly supported him. In 2011 Royie Nazombe, head of the Hands at Work Service Centre in Malawi, began mobilising the local church in Maonde and training volunteers from those local churches to be Care Workers, looking out for the most vulnerable people in their community. 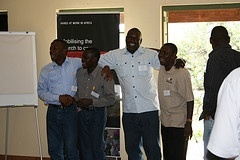 These churches and volunteers founded the Chisomo Community Based Organisation (CBO) in Maonde. Most people in Maonde have always passed by Sekani without a second glance. But Mlangani, one of the local volunteer Care Workers, took notice of him. Mlangani says, “He needed a new standard of life. I couldn’t just watch people walk by him anymore”. Mlangani stepped in to love and care for Sekani not only as a Care Worker, but as a friend, bringing food and clothes, and bathing Sekani daily. The most radical change has been the involvement of the community in Sekani’s life. Mlangani’s relationship with Sekani has inspired the people of Maonde and has encouraged many to bring light into Sekani’s situation. Sekani had always lived in a tiny shack (see photo at left) with his mother, in which they would have to huddle at night just to sleep. A group of young Care Workers finally realised that this was an unacceptable situation. These young people, themselves very poor, pooled whatever they had and helped to construct a decent two-roomed house for Sekani and his mother (see photo at right). No longer is Sekani forgotten and passed by with indifference. 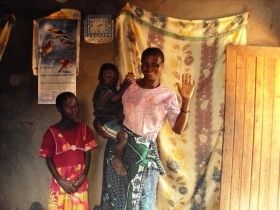 Mlangani and many other Care Workers are bringing a change that gives hope for the future of Malawi. This is the church in action! The Dedza Service Centre has a team of volunteers working to support Chisomo and other CBO’s with the vision of bringing transformation to the vulnerable across the entire country. And as this team looks to care for a nation, each day Mlangani will visit Sekani, ensuring one by one the vulnerable are loved and cared for. Lainess with the children she cares for - Thandi and her younger brother TamandaniOne of the children being impacted in Malawi is Thandi. She was 12-years old when her mother died and her father, as his culture customarily dictates for a male widow, abandoned the family. Thandi was left alone to care for her 18-month-old brother, Tamandani. Living in their rural Malawi village, Chinku, there were no social services or support to aid them. The situation had seemed hopeless until a local woman named Lainess, whose church was mobilised by Royie and the Hands at Work team, came to their aid. Lainess had suffered the early death of her husband and had been struggling to make ends meet. But after hearing the stories of what was being done by the churches in nearby Mgwere, she felt compelled to participate in demonstrating the compassion of Christ and joined others in her community to become part of the Chinku volunteer care worker team. That’s when she decided to open up her home and take Thandi’s family under her care. Lainess does everything she can to fill the gap left by their parents; in order to secure milk to feed young Tamandani, Lainess regularly makes the day’s journey by foot to the city of Lilongwe where she is able to get milk from an organisation operating there. Growing in understanding of the needs of vulnerable children in her community like Thandi & Tamandani, Lainess helped her church join with other churches in the area to launch a school and care centre. It’s a safe place for Thandi & Tamandani to come and just be like other children their age while Lainess is learning to be a mother for two more very grateful children.